The vice president says China is engaged in an "unprecedented" effort to influence U.S. public opinion. WASHINGTON — The White House is trying to make the case that China is taking new and more aggressive steps aimed at influencing U.S. elections, political debates and policies, even suggesting that Beijing wants to oust President Donald Trump. 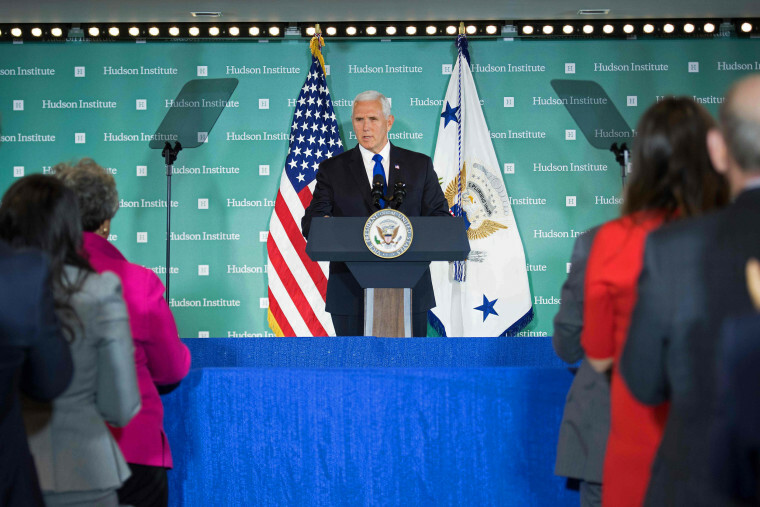 Vice President Mike Pence, in a speech Thursday, bluntly accused China of "meddling in America’s democracy" to an extent that far surpasses Russia, though he provided little detailed evidence to back up his claim. "China has initiated an unprecedented effort to influence American public opinion, the 2018 elections, and the environment leading into the 2020 presidential elections," Pence said. "To put it bluntly, President Trump’s leadership is working; and China wants a different American President." President Trump made similar claims in a speech to the United Nations last week. A senior administration official said the White House is reviewing China’s actions to determine if any of them would elicit a response, including possible sanctions under an executive order on foreign interference in U.S. elections that Trump signed last month. The official declined to provide further detail on those deliberations. Pence’s speech was intended to lay down a marker on an issue the White House plans to highlight more in coming weeks, according to administration officials. The officials said the heightened concern stems from China’s attempts to influence U.S. politics in its trade fight with Trump, as well Beijing’s continued attempts to meddle with American businesses, research facilities and education institutions. Trump has implemented tariffs on $250 billion in Chinese goods, and Beijing has retaliated with tariffs — many aimed at industries and regions of the U.S. that are politically important to Trump. Administration officials said some of China’s actions are overt, such as a recent advertisement in an Iowa newspaper, the Des Moines Register, and others are covert. Pence said U.S. intelligence officials say "China is targeting U.S. state and local governments and officials to exploit any divisions between federal and local levels on policy," particularly on tariffs. Asked how the administration intends to respond to China’s behavior, the senior administration official said a large part of that effort involves educating the public about what Beijing is doing. The official also suggested the administration plans to pressure academic institutions, think tanks and media outlets not to accept money from China. The senior administration official said China is using its large Chinese student population in the U.S. as to carry out espionage and influence by intimidating administrators, professors and students. China has the largest foreign student population in the U.S., with 350,000 Chinese university students in the U.S. and 80,000 high school students, the official said. During his speech, Pence underscored the importance of a free press, devoid of censorship, a notable contrast to the combative approach Trump has taken toward the media, which he has described as an enemy of the state. And while the White House has vowed a tougher approach to China, with the senior administration official describing Beijing as a competitor, officials say Trump still wants a cooperative relationship with Beijing. "He doesn’t want a confrontation," the official said. "But he also realizes that we have to compete."